The responsibility of building strong writers can seem overwhelming, regardless of the grade you teach. And since every classroom includes a broad range of students at varying writing levels, a canned writing curriculum will never meet the unique needs of every student. That's why our team believes so strongly in the Six Traits of Writing. It's not a program, but a framework that uses the six qualities of “good” writing to guide every lesson, assignment, and assessment. If you want to learn about the Six Traits of Writing, you've come to the right place! For more than a decade, we've been helping educators build strong writers with the Six-Traits framework. In this guide, you'll find a comprehensive overview of the Six Traits of Writing with suggestions for implementation in your own classroom. Let's get started! Read through the whole guide or quickly jump to a section. The Six Traits of Writing are rooted in more than 50 years of research. This research reveals that all “good” writing has six key ingredients—ideas, organization, voice, word choice, sentence fluency, and conventions. These key components provide teachers and students a common understanding for how to compose, revise, and assess all types of writing. They are inherent in well-written essays, reports, blogs, poems, videos, and other genres. But they are also evident within the products of our youngest writers—pictures, labels, lists, etc. This shared vocabulary allows teachers and students to communicate about the strengths and weaknesses in writing. The Six Traits take the mystery out of what a “good” one looks and sounds like. It's important to recognize the Six Traits are not a program. They are simply six words, six characteristics, six ingredients inherent in strong writing. Therefore, this vocabulary integrates easily into any writing curriculum. Let's take a quick look at each of the writing traits. Develop a single topic to convey a clear message. Reveal ideas in a logical order, including a beginning, middle, and end. Increase reader engagement with intentional writer feeling, attitude, and emotion. Use the right word in the right place to convey just the right meaning. Improve the readability of a piece with complete thoughts and sentence variety. Make writing more correct by following the rules of spelling, punctuation, capitalization, and grammar. Do the traits align with the standards? Integrating the Six Traits into your writing instruction is not an either-or decision. It’s NOT that you either teach the standards or the Six-Traits model. Rather, the power is in marrying the state standards with the trait language. 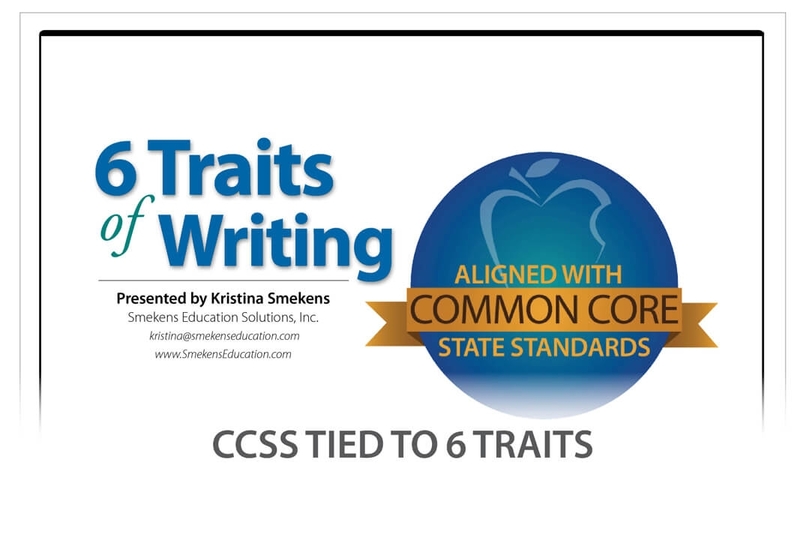 Whether your state follows the Common Core or its own set of academic standards, the expectations for achievement in writing are steeped in the Six Traits. Within the college and career-ready writing standards are dozens of individual skills. Think of each skill as an individual raindrop. As the school year progresses, dozens of skills are introduced, making it nearly impossible for anyone to remember them all. Each trait represents related skills that have a similar impact on the overall writing. Again, the Six Traits are just six words that organize writing instruction! While the Six Traits of Writing are inherently present in state and national standards and in all curriculums, it can take a critical eye to parse out individual subskills and tie them to specific traits. We have taken the time to do just that with the standards listed below. By using these documents as a guide, the process of intentionally tying instruction and assessment to the Six Traits is a lot easier. When you’re ready to integrate the traits into your writing instruction, the first challenge is to introduce the vocabulary. The power in the Six Traits is only achieved if teachers and students know them. Allocating instructional time for the Six-Traits roll-out is key to long-term success. How do I introduce the Six Traits to students? Set aside 1-2 writing mini-lessons to introduce each trait—that's 6-12 days total. Within these initial lessons, introduce the six terms quickly. We want students to see these six separate ingredients as facets of a complete and strong product. Although six days seems fast, students aren’t mastering the traits; your purpose is simply to establish a common language. Not only do you want to consider the pacing of your introduction but also the common thread. For example, if you use a mentor text to introduce the Trait of Ideas, use a mentor text to define each trait. If you use a song to introduce the first trait, you should use parallel songs to introduce all the other traits. A consistent or patterned approach to the introduction reminds students that the traits all work together. Honor different learning styles. The more visual you can make your writing instruction, the more students you will reach. Consequently, introduce each trait verbally and visually with a purposeful graphic icon. How do I teach the traits? It’s important to note that we aren’t teaching traiting; we are teaching writing. Consequently, even though the first days are spent introducing the six "umbrella" ingredients, the rest of the year is dedicated to teaching individual "raindrop" skills that fall under each trait and are required by the standards. The Six-Traits framework comes into play when teachers are intentional about tying each mini-lesson skill to the specific trait it falls under. Whether it’s drawing “close-up details” in the primary grades or developing paragraphs with evidence and elaboration in the upper grades, the Trait of Ideas is always the starting point. All those great ideas now need to be organized. Titles, transitions, and logical flow all play a role in clearly conveying the writer’s message. Voice reveals the writer’s attitude and tone regarding the topic he is writing. This is most often accomplished through word choice, sentence structure, and intentional punctuation. Strong word choice involves more than simply plucking big words from a thesaurus. It’s about utilizing the right word in the right spot. This includes precise nouns, action verbs, descriptive adjectives, and varied synonyms. Mastering sentence fluency requires two skills—attention to sentences and fluency. Initially, complete thoughts and accurate sentence structure is the focus. However, the sophisticated fluency skills that also fall under this trait improve the sound of the piece. Achieving the technical requirements of writing is essential for the reader to glean the writer’s intended message. By editing for accurate spelling, grammar, punctuation, and formatting, writers learn the importance of conventions. Since every writing skill falls under one of the Six Traits, it makes the most sense to organize your lesson materials and resources by trait—not by writing unit. If you are looking to organize digital documents, then establish six folders on your computer—one per trait. Regardless of the organizational method you choose, house individual lesson plans, resources, and writing samples within their broader trait categories. Each writer’s workshop begins with a mini-lesson. This time of direct, whole-class instruction is important, but it needs to be short. After all, students' writing doesn't improve by listening to the teacher. They get better experimenting with the skill during writing time. With this in mind, make it a priority to keep your daily mini-lessons mini—10-15 minutes long. Best-practice mini-lesson instruction always contains four essential steps. Announce the day’s target skill. Remember to keep the focus small. For example, rather than teaching different types of sentences, focus only on combining ideas into compound sentences. Within this introduction, identify which trait this skill impacts. Demonstrate how to execute the skill live and in front of the students. This requires more than just showing examples from mentor text. Plan to model using Think Alouds. If Step 2 is the “I do,” then Step 3 is the “We do.” During this part of the lesson, the whole class works together to apply the skill with the teacher providing support. Although this interaction step includes student participation, it’s important not to lose control. Rather than calling on individuals during the mini-lesson, engage all students with opportunities to think through the skill. Use code phrases like “Turn & Talk” and “Back to me” to let students know when to pool their thinking with a peer and when to return their attention to instruction. Step 2 of a mini-lesson often includes revealing examples of the skill in action. 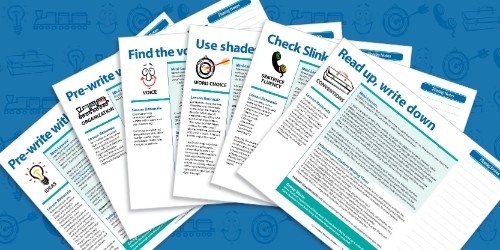 Although workbooks and worksheets include examples, they are typically contrived and formulaic and lack the quality and sophistication of authentic sentences. Mentor text reveals the skill within real-world writing. Consider sharing picture books with your students to demonstrate a specific trait. Even middle school and high school students enjoy picture books! Look for excerpts from chapter books and novels that exemplify a specific writing skill. Collect authentic text (e.g., newspaper articles, websites, cartoons, etc.) to show students that current trends in writing include the traits. Use student anchor papers to convey what "good" writing looks like for a specific assignment. Increase student engagement during a Six-Traits mini-lesson by incorporating a trigger. Not only do visual aids add a level of energy and excitement, but they also help students remember the purpose and function of specific writing skills. 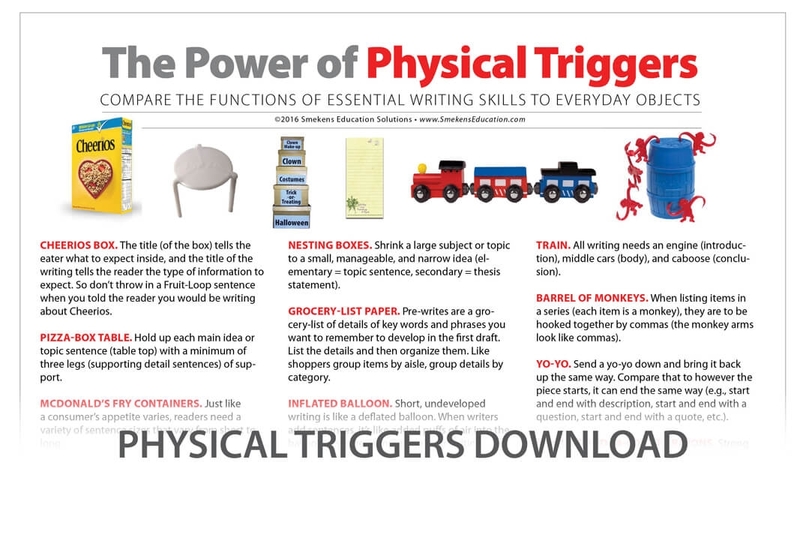 When identifying a mini-lesson trigger, first consider the function of the writing skill. The key is to really understand the purpose the skill serves within writing. When do writers use the skill? Where do writers use the skill? What's the impact of the skill on the message? Then, with that knowledge, brainstorm an object in the real world that functions similarly. For example, when teaching students to write about a narrow topic (or focused thesis statement), the goal is to show them how to go from a large, broad subject to something smaller, more finite. It's all about shrinking the topic. Everyday items that get smaller are Russian stacking dolls, Tupperware, and nesting boxes. Reveal one of those objects within the lesson to demonstrate how a large subject can be narrowed down to a smaller, more focused topic. Students don't learn everything in a single 15-minute mini-lesson. Consequently, plan multiple mini-lessons to teach a specific skill. This requires slowing down instruction—and expectations. Provide opportunities for students to first recognize the skill in mentor text before expecting them to try it and apply it within their own writing. With this slower approach, each day of a mini-lesson series serves a different instructional purpose. DAY 1: First, reveal excerpts of authentic text where the skill appears. Think Aloud about how the excerpt impacts the reader's comprehension. This is the concept of Notice & Name It. If students don't recognize the skill in action, then they can't apply it intentionally. DAY 2: The first mini-lesson focused on studying the skill as a reader. Day 2 transitions to Try It as a writer. Instruction must include the teacher modeling how to return to a previous draft and insert the skill in context. This will again require Thinking Aloud during the lesson. Students must hear how an expert discerns when, where, and how to incorporate the skill within his own writing. DAY 3: The third day of a mini-lesson series transitions to lifelong acquisition. Teach students how to incorporate the skill while composing a first draft (rather than as a revision technique as practiced the previous day). This kind of instinctive application demonstrates mastery. Follow the Notice it/Name it, Try it, Apply it progression within a mini-lesson series on possessives. One of the most powerful aspects of the Six-Traits language is its application beyond instruction. Provide writers with clear feedback within formative assessments and daily conferences utilizing the same six ingredients. How do I use the Six Traits to offer feedback? A conference is nothing more than a conversation. It doesn't have to be a formal 20-minute ordeal at a "conferencing table" in the corner of the room. In fact, execute fewer “product” conferences and more “process” conferences. This way you can help students when they are in the middle of the writing process instead of after they are "done." The most vital pieces of a writer conference include offering a specific trait compliment (area of strength) and comment (area of weakness). The same "raindrop" writing skills taught within mini-lessons are referenced within these trait-based conferences. For example, Jeremy, your word choice in this piece is fantastic! I love the words "bloated, alarmed and screeched." AWESOME verbs! Now, I am wondering about your sentence fluency. Most of your sentences are the same length. Consider inserting some compound sentences and then put your draft through the Slinky Test. In order to label each compliment and comment with its broader trait "umbrella," you will need more than a poster on the wall. That's why many teachers rely on the Six-Traits Cheat Sheet during their writers' conferences. While students share their writing, you’ll be able to quickly glance at your cheat sheet to anchor your feedback with Six-Trait connections. After providing explicit writing instruction, it’s time to assess for mastery. 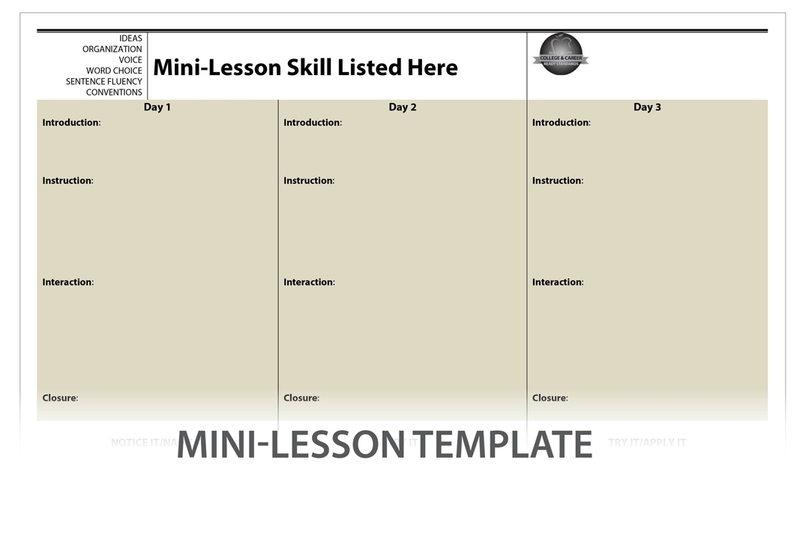 The same trait-based skills taught within mini-lessons are embedded within rubric criteria. How do you assess student writing with the 6 traits? Often teachers draft a rubric on their own and then "go over" it with the kids. However, with this approach, students have little ownership and may not understand some of the rubric language. Consequently, create a writing rubric with your students. Since the criteria and language are generated by the students, this ensures that it’s a kid-friendly assessment tool. Furthermore, this method honors the education research. HIGH: Work together to describe what each trait looks like within a "good" one. MIDDLE: Then, consider a "pretty good" piece—one not as strong as the HIGH but not LOW either. This MIDDLE level must include parallel criteria described in the HIGH level. LOW: Repeat this process describing the qualities and characteristics of a LOW-level product. With three rubric levels described, stretch them out to represent Levels 1, 3, and 5. Then add Levels 2 and 4 in between. While it's true that the writer's purpose and presentation may look very different among narrative, informative, persuasive, and argumentative units, they all possess the same basic ingredients of good writing—the Six Traits. Consequently, the core of any trait-based writing rubric will be applicable to all genres. Because of this umbrella effect, the same rubric can be applied to various genres without having to create a new one for each unit. However, this requires users to know how to tweak their interpretation of the rubric criteria according to the genre. For example, the criteria "ideas are well developed with supporting details" will have a different interpretation among narrative, informative, and argumentative writing. With a kid-friendly Six-Traits rubric, you can provide students with individualized feedback on their writing. But contrary to popular belief, providing precise feedback to student writers does not have to involve an all-encompassing critique with the red pen. After creating/updating the rubric with students, use this tool to do the majority of the work. Accompany each piece of student writing with a copy of the rubric. Instead of writing Add more detail or Fantastic verb choice in multiple places on the student's draft, simply highlight those criteria within the rubric. Next to the highlighted criteria, include specific words or paragraph numbers this comment pertains to. Using the annotated rubric, students apply your customized comments and compliments in revision. This approach helps teachers transition from simply fixing writing to focus on building writers. NO ONE CAN FAIL ON THE RUBRIC. Students earn a failing grade if they do not attempt the assignment (i.e., do not turn it in). However, submitting a product must qualify them for at least a D-. If a weak attempt is valued the same as no attempt (i.e., failing), then many students stop trying. Therefore, the lowest score on the rubric, a Level 1, needs to be within a passing range (e.g., 60% or D-). HONOR THOSE WHO GO BEYOND THE GOAL. Include at least one level that describes a product that knocks your socks off. Have an A level (Level 4), but then have an exceeding or A+ level (Level 5). DON'T WEIGH TRAITS EQUALLY. Depending on the piece, different traits are emphasized. If students are only writing a first draft, then conventions would likely weigh less than the traits of ideas and organization. However, in poetry, word choice and sentence fluency might be valued more. Identify the traits you want to score and the point-value that coincides with where you spent your instructional time. Regardless of which traits you are scoring and/or emphasizing, be sure to communicate this information to students before they write. Remember, they are trying to shoot at a target, so clearly define what it is. When it comes time to convert a rubric score to a grade, avoid the temptation to simply add up the levels as if they are points. Rather, utilize the Smekens Six-Traits Rubric Calculator with any 5-point rubric of your choosing. Identify which traits you want to score. Determine the value you want to give each one. 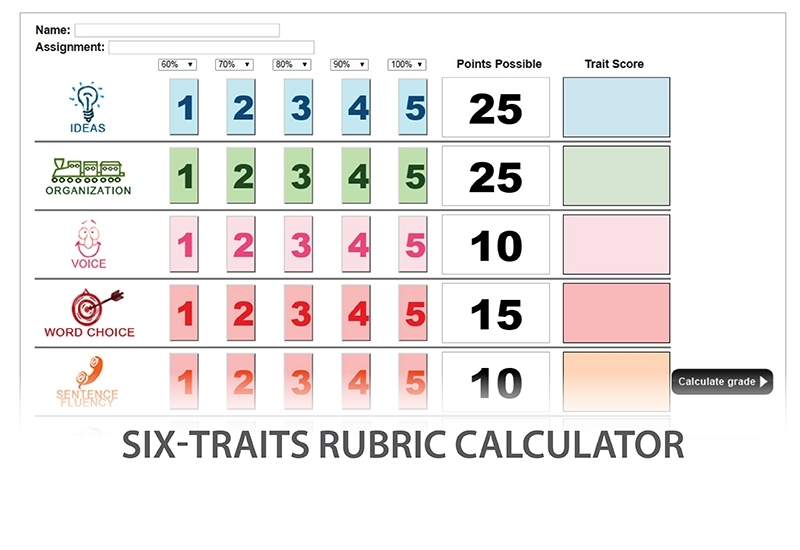 Click each individual trait score based on rubric criteria. Click to calculate the earned grades, points, and percentage for your grade book. How are the Six Traits assessed on standardized tests? For most standardized writing assessments, students earn a passing score for their strong execution of the traits of ideas and organization. This typically includes communicating relevant and well-developed information (with textual evidence) in a logical and coherent order all within a first draft. This is why we refer to the traits of ideas and organization as the "Trump" Traits. Although many rubrics include criteria for word choice, sentence fluency, and/or voice, they are often labeled as "style." Although these traits are usually not essential to earn a passing score, these ingredients may bump their performance to the "exceeding" or "pass-plus" level. Because the Six Traits are present in all good writing, it stands to reason that the rubrics for state and national writing exams are rooted in the same six ingredients—and they are! However, it can take a critical eye to determine which criteria fall under which trait. We have taken the time to do just that with many standardized-test rubrics. To appreciate the emphasis on the traits of ideas and organization, note the amount of blue and green criteria within each of the downloadable rubrics listed below. Where did the traits come from? In the 1960s, a researcher named Paul Diederich asked a group of professionals to identify what makes writing effective. He received hundreds of responses, ranging from strong metaphors to correct semicolons. But no one can remember hundreds of things simultaneously, so Diederich grouped the responses and found they fell within six categories. In 1984, literacy expert Vicki Spandel led a team who replicated Diederich’s study. In the end, Spandel, curriculum experts at the Northwest Regional Education Laboratory, and willing teachers from Missoula, Montana and Beaverton, Oregon all settled on the same six ingredients. Since that time, the research has been formally conducted a third time. Using an even wider variety of writing genres, including digital and online writings, Education Northwest has proven that the same six ingredients are still the core of “good” writing. The Six Traits of Writing model is now used in all 50 of the United States as well as multiple countries around the world. Written by Lois Bridges, Ph.D.
EXCERPT: For more than two decades, the Northwest Regional Educational Laboratory (now known as Education Northwest) and other researchers have studied the effectiveness of the Trait Model and the professional development tools used to train the teachers who use it. In a nutshell, the traits represent the essential elements of writing inherent in all extended written communication: ideas, organization, voice, word choice, sentence fluency, conventions, and presentation. 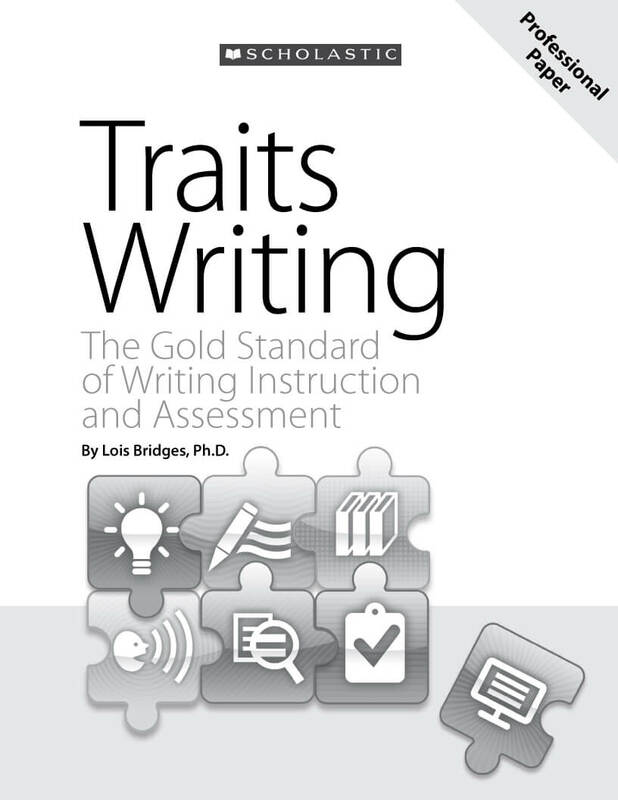 Educators who use the Trait Model center both their instruction and their assessment on helping students understand how these elements work together and interact to create a well-written, cohesive piece that accomplishes the writer’s goal. EXCERPT: The study was designed to estimate the impact of 6+1 Trait Writing on student achievement in writing during the first year of a typical implementation. This question was addressed among grade 5 students in Oregon using a single “holistic” writing score on student essays. Exploratory analyses using six scores on specific traits of writing were also conducted. Professional development was provided by the model developers in the same year that student assessments were administered. The particulars of school and classroom implementation of the approach were allowed to vary in the schools, without any special oversight or intervention by the developers beyond the technical assistance normally offered to those who receive the materials and professional development. 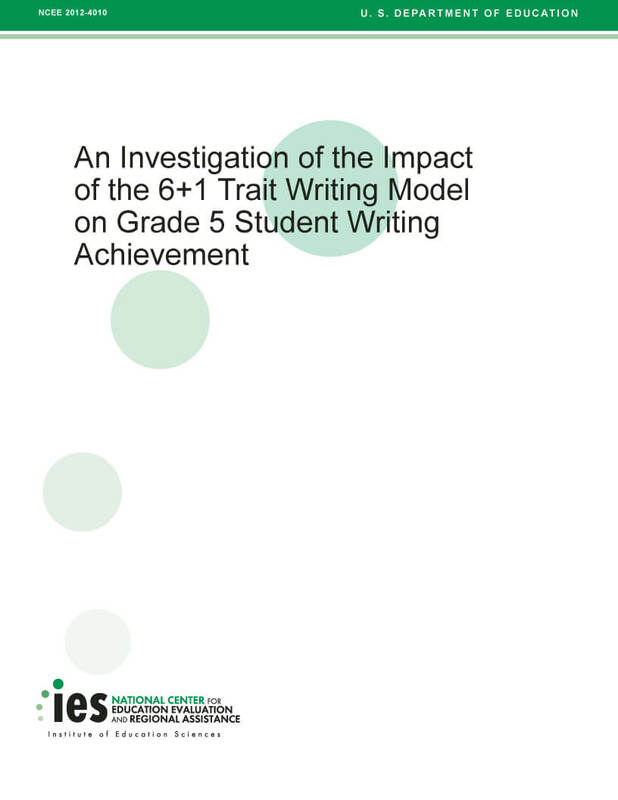 For the confirmatory research question (What is the impact of 6+1 Trait Writing on grade 5 student achievement in writing), use of the 6+1 Trait Writing model caused a statistically significant difference in student writing scores. Students grow when their teachers use targeted language to teach and assess their writing. Furthermore, when an entire grade level, department, or school use the Six-Traits framework with fidelity, the impact is enormous. When a K-5 school, for example, commits to Six-Traits implementation, students at every level are exposed to age-appropriate mini-lessons, mentor text, anchor papers, and writing rubrics—all of which are intentionally tied to the Six Traits. That consistent exposure to the same elements over a period of years strengthens students’ depth of knowledge but also their capacity to apply the traits in narrative, informative, persuasive, and argumentative pieces. Such repeated exposure requires more than a poster and six words. It’s about the daily and explicit teaching of dozens of granular writing skills across the grade levels and tied to the Six-Traits language. Most English/language arts textbook publishers are intentional about labeling their resources with the Six-Traits language. But too often, boxed curriculums lack the depth and intentionality that is required in order to fully implement the Six Traits. In order to know how to launch and execute a fluid Six-Traits model that is responsive to student needs, teachers need the support of ongoing professional development. After all, most teachers didn’t learn how to teach writing in college, making vague guidance from the language arts textbook a recipe for shallow writing instruction. Using professional development as a catalyst to building-wide implementation of the Six Traits involves a continued cycle of professional learning, practice, and collaboration. Initial professional learning on the Six Traits should focus on building a shared understanding of not only the six words, but more importantly, what the traits look like in all genres and at each developmental level (i.e., pictorial writing in grades PK-1). With this in mind, the first focus of professional learning is to identify what teachers already know about good writing and marry it with the Six-Traits framework. Teachers will be put at ease when they realize they don’t have to abandon all that they are already doing. After a baseline understanding has been established for teachers, the next step is to reveal strategies for introducing the trait language to students. It’s important for teachers to learn classroom-tested techniques. This includes how to use characters, picture books, graphic icons, songs, or a combination of these tools to launch an intentional introduction of the Six Traits. This sets the stage for a yearlong sequence of trait-based writing lessons tied to different modes and genres. Get the ball rolling with a book study that examines the foundations of the Six-Traits framework. Great starter titles include Ruth Culham’s books, 6+1 Traits of Writing: Primary Grades, 6+1 Traits of Writing: Grades 3 and Up, and Traits of Writing: The Complete Guide for Middle School. Schedule on-site, face-to-face professional development led by an expert Six-Traits practitioner. 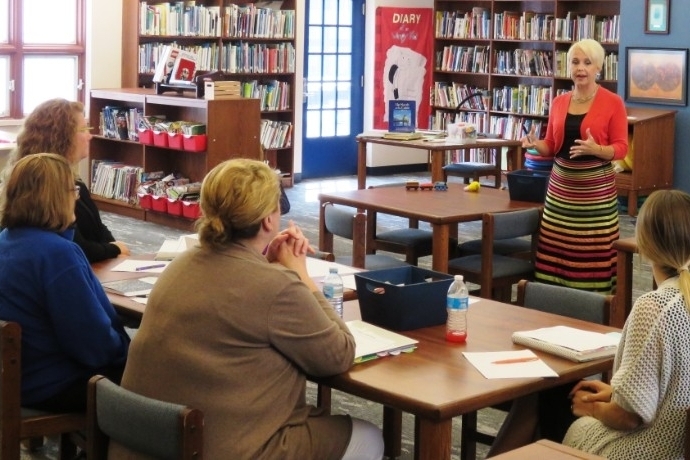 With on-site visits from a Six-Traits expert, staffs can participate in a full range of learning opportunities that span from introducing your whole staff to the Six Traits to mini-lesson modeling in classrooms. Provide time during the school day or in the summer for every teacher to participate in Six-Traits workshops. With cost-effective online options like those available from Smekens Education’s webAcademy, the entire staff can use on-demand videos to learn innovative ways to launch and begin to implement the Six Traits. After teachers have embedded the Six Traits into their writing lessons, assignments, and assessments, engage teams in instructional rounds. This activity allows educators to observe their colleagues deliver trait-based instruction and then collaborate afterward to offer feedback and encouragement. Use PLC time to examine how the Six Traits are being implemented and how learning is ultimately being impacted. As learning gaps are identified throughout the school year, use professional learning tools such as Smekens Education’s webPD to provide teachers with innovative strategies to address specific writing weaknesses. Offer teachers ongoing implementation support with an instructional coach. Whether turning to a highly-trained in-house staff member or leaning on an outside expert like Smekens Education’s Remote Coach, this type of sustained guidance will help teachers maximize success with the Six Traits. What do I have to buy to implement the Six Traits? Because the Six Traits of Writing aren't a program or a new curriculum, you don't need to purchase specific products or canned materials in order to implement them. Any well-written writing curriculum naturally includes lessons to teach the skills that fall under each trait. Granted, it’s one thing to know the six words, but it’s another challenge altogether to weave those traits into daily instruction. If you surf the internet, you’ll find hundreds of cute signs, graphic organizers, and downloadable templates that are tied to the traits. But for a cohesive collection of free, innovative resources, the best place to start is the Smekens Education Idea Library. Here you’ll find Six-Traits lesson ideas, pictures, videos, whiteboard downloads, anchor papers, rubrics, graphic organizers, and more. When you’re ready to invest in published resources, there are plenty of options. In my list of recommended Six Traits mentor texts and professional books for grades K-2, 3-5, and 6-12, you’ll find great choices for budgets of every size. 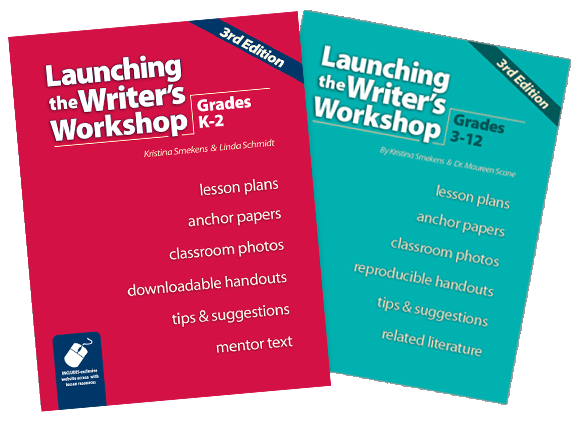 Or consider using our resource Launching the Writer’s Workshop. It’s customized for grades K-2 and grades 3-12 and filled with lessons to help you establish a writer's workshop, introduce the traits, and teach trait-based lessons all year long. But whether you are starting with nothing or your toolbox of resources is full to the brim, none of it matters if the Six Traits do not become part of your daily writing classroom. Remember, it starts with recognizing that all good writing contains ideas, organization, voice, word choice, sentence fluency, and conventions. These are the six ingredients that define, dissect, and describe “good” writing. This dynamic online workshop equips K-12 teachers with the knowledge and tools they need to start teaching the Six Traits of Writing right away. 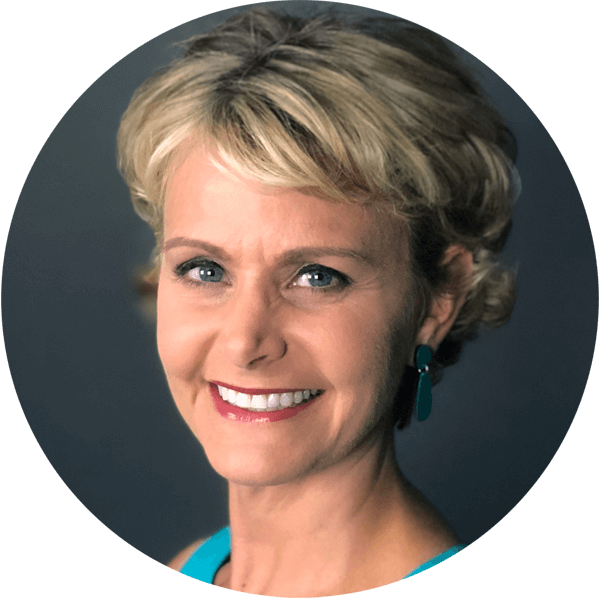 Whether you need to learn a lot about the Six Traits in a hurry or want a “refresher” workshop to get you back on track, this introductory training led by Kristina Smekens provides teachers with the confidence and resources they need to begin implementing the Six-Traits model. Have a question about the Six Traits?